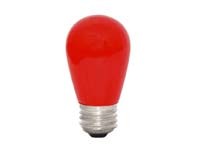 This red LED bulb may be used as a temporary or economy safelight for B&W photographic papers or ortho materials. By using LED's for illumination, power consumption is reduced to just 0.5W, and lamp life is rated at 30,000 hours. Simply screw the bulb into any standard light bulb socket. As with all safelights, it is important to test to determine the amount of safe time the safelight provides before fogging occurs. We suggest a minimum working distance of 6 feet with this lamp. NOTE: No safelight is 100% safe for an indefinite period! Always perform a safelight test with the materials you're using to determine the maximum exposure before fogging begins to occur. For information on how to conduct safelight testing, click here.